Deb's Cup of Tea: Hit Me With Your Best Shot! Okay Mr. Blizzard. You're supposed to drop by at 3 p.m. today. I'm waiting. I went to the grocery last night after work. I was heading there anyway, blizzard or no blizzard, because I was out of a lot of stuff. My last big trip to the grocery was at the beginning of December. I got everything on the list and a couple of things not on the list and realized I should have picked up some more tangelos. They were so good. 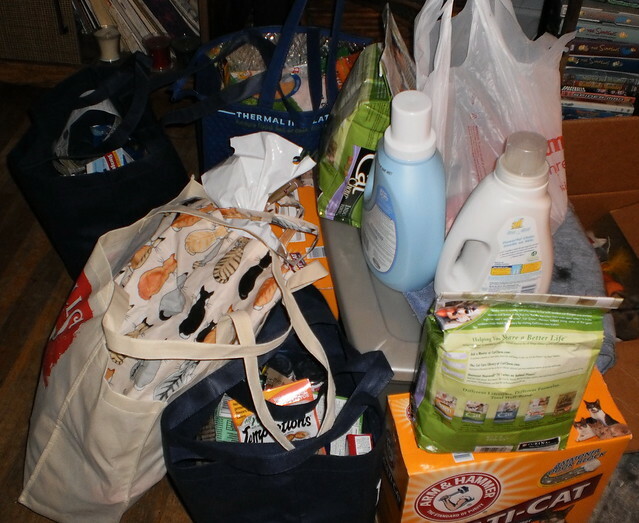 But you can see the bags of cat food, pouches of treats and boxes of kitty litter. That's what really matters you know. Bread? Check. Shredded cheese? Check. Hamburger? Check. Yogurt and orange juice? Check. Laundry detergent, fabric softener and pre-wash? Check. Check. And check. I'm probably good now until March, although I may be out of cereal in a couple weeks since that's what I eat during the week. I will get gas in the Jeep on the way home and I'm good to hunker down for a couple of days. So, I got to thinking, how best do I show this blizzard? I should have taken a photo of the sunshine yesterday afternoon at 3. That was kind of unexpected. We got the first wave of snow last night. I awoke to a couple fluffy inches. Right now, at 9:30 a.m. on Tuesday, the prediction is overnight to get 16 - 18 inches. Then there will be 2-4 additional inches dumped on top of that. The wind is to pick up tomorrow morning to blow around whatever falls. Do I measure it on the deck rails? I'm not sure 16 inches is even going to sit on the rails. I think the height of the snow will cause it to fall to maybe 7 inches. I think that's the deepest I've seen on the deck railings. 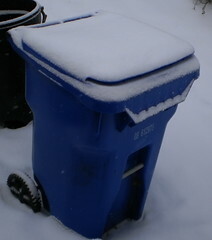 Do I measure it on the top of the recycling can? That might be a good idea as I won't be getting into that any more this week. One of my tasks last night was taking all the fruit and vegetable scraps to the compost pile and all the recyclables to the bin. The Jeep is a good place to measure depth. The thing I will need to do in the morning regardless of how windy or snowy is get out there and brush the accumulation off the top of the Jeep. That depth of snow is not good for the soft top. I'm backing into the drive tonight. I've debated tucking the car next to the house but that doesn't leave room to sweep the snow off the roof. In theory folks, there should be snowfall equivalent to the bottom of the door of the Jeep. We'll see. I probably ought to shovel a few times tomorrow, too, just to keep the deck and the front porch reasonably clear. 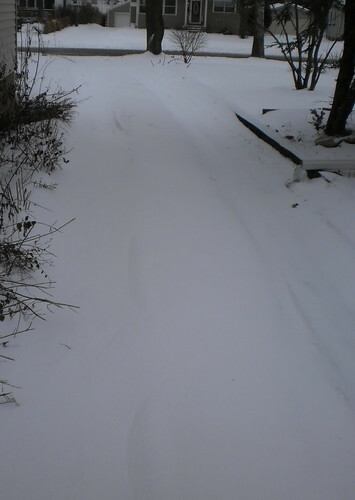 I look at my driveway and I think back to previous blizzards. The problem is going to be the minor hill I have. The drive looked like this today. Not much to write home about. I needed 4-wheel drive to maneuver as there is ice from the weekend's thawing under the snow. Beyond the house is an 18 inch hill that will fill in as the wind blows the snow across the front yard. This is why snow fences were invented. The fence breaks up the line of the wind causing the snow to collect behind the fence, keeping the road or the farmer's house area free of the deep stuff. 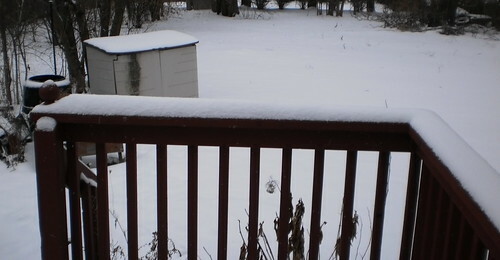 I was thinking about that as I backed out, how a snow fence on the north side of the yard would be a good idea. I forgot to dig out previous blizzard photos so I'd have something to compare with what's coming. I'll try to remember to do that as I think, if it comes as predicted, I won't be working tomorrow. I'll be out shoveling the drive to remove a drift. But this is winter in the upper Midwest. I'm actually kind of excited for it to arrive. I have hot cocoa. I have books. I have a couple of cats to cuddle with. I'm good.